Based on the proven HEGNER electronic speed control, thanks to which the speed of the saw strokes is ideal can be adapted to the material to be processed and the needs of the user, HEGNER has this innovative new control concept developed. The foot now regulates the speed of the machine, this is particularly advantageous when sawing elaborate subjects. Without interrupting the sawing process, the speed can be adjusted with the help of the foot during the transition from long straight lines in filigree sections with narrow radii and angles can be adjusted continuously. Without interrupting the sawing flow, The hands can now remain on the workpiece for the first time. In addition to the advantage of the workload is thereby decisively improves the sectional image. If larger sections and workpieces are sawn at a constant speed, the foot can be removed from the pedal become. The machine keeps the set speed constant until the foot pedal is pressed again. The electronic speed control from Hegner guarantees a uniform distribution of power over the engine complete speed range, even at low cutting speeds. 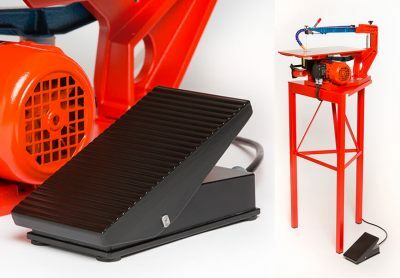 Technically, the electric foot pedal can not be retrofitted to older models, but is only with the new model one HEGNER Multicut available.